I understand that there are cooks who plan out menus and then peacefully prep their ingredients in advance. Come dinnertime, these lucky souls simply slip a dish into the oven and then casually toss a salad with one hand while sipping an aperitif with the other during the few moments it takes the meal to finish cooking to perfection. I don’t cook like that. Finally, I consider how much more time I have before I want dinner on the table. If I have an hour, maybe I’ll start a pizza crust and start roasting some potatoes. If I have two, I might start a soup with long-cooking legumes. But if I want dinner on the table in 20 minutes, I might make this quick curry. If YOU want to have dinner on the table in 20 minutes, go put on a pot of jasmine rice and then check back with me. Ready? Ok. It’s a Thai green curry, and I made mine with a thin filet of cod that went straight from the freezer into a bowl of hot water to defrost in minutes (don’t worry, Harold McGee says it’s ok). You could go the fish route too, or you could use shrimp or chicken or tofu. Sauté a thinly-sliced onion until it starts to soften, then add 2-4 tsp. 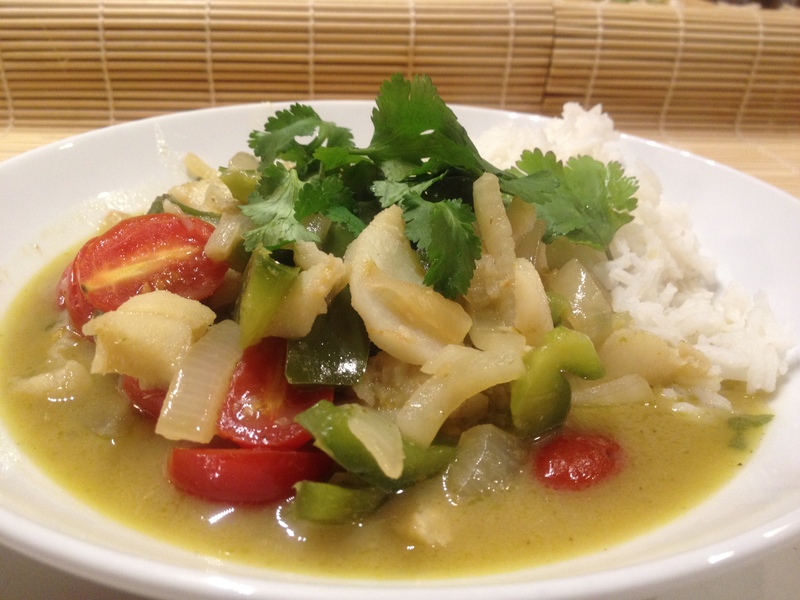 green curry paste and sauté for a moment to release the fragrance. Pour in a can of coconut milk and add 1 Tbsp. each of fish sauce, brown sugar, and lime juice. Bring to a simmer, then add a pound of white fish in 1” chunks (I used cod; you could also use shrimp, chicken, or tofu) and sliced veggies (I used a green pepper, a stalk of celery and a small zucchini). Simmer, stirring occasionally, about five minutes or until the fish is cooked. Toss in a big handful of cilantro and chopped tomatoes for the final minute, then give it another squeeze of lime and adjust the flavors to taste with more lime, brown sugar and fish sauce. Serve over hot jasmine rice. p.s. This Noodle Curry with Tofu, Sweet Potatoes and Chard is pretty quick too, and also delicious. This entry was posted in Asian Flavors, Fish, Tofu, Vegan or Would-Be-Just-As-Good-Vegan and tagged children, cooking, fish, food, lifestyle, recipes, vegetarian on January 25, 2012 by emmycooks. Wow! I would be happy with just 3 days of plans. Good for you! I too defer to Harold McGee! If he says it’s okay, it must be, right? Would love to be one of those people too who can great guests with a glass in one hand, and 5 courses ready to go in the kitchen. Sadly, am always the person scrambling!